The Legend of Zelda is the game series that we all know and love. Almost all of us hold the Super Mario series very close to us as well. For a lot of us, Super Mario 64 was our very first video game ever. I love them both, but has the Zelda series made decisions so that the games are stuck at a standstill? The main problem with the Legend of Zelda is that it’s too defined; they gave the series too much structure and not enough breathing space. Mario, on the other hand, has far more breathing space than Nintendo knows what to do with. Sure, Mario might have gone overboard with the spin offs, but when Nintendo’s developers really puts their heads together, they create masterpieces. One good example is Super Mario 64. It draws pretty far from the original Super Mario Bros, but all of us love the game; Super Mario 64 was the basis for Super Mario Sunshine, and both of the Super Mario Galaxies. All of these games add something that some people would question. That is, if they were more defined like Zelda is. 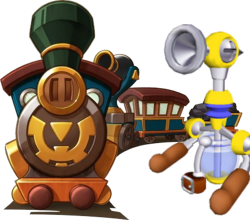 The Legend of Zelda: Spirit Tracks on announcement had everybody saying, “Why the heck does Link have a train?! This is Zelda! They’re supposed to have swords!” That’s a very good example with the structure of Zelda interfering with their breathing space; Wind Waker had the same case. The Cel-Shaded graphics were a big change from the realistic styling of Ocarina of Time, which left gamers really angry, thinking that it either looked just terrible, or that the game was too childish for them and they were “bigger than that”. That bold move eventually led to be a good one, as Cel-Shaded Zelda became sort of its own series. Super Mario Sunshine added FLUDD, a water gun styled item that was a large focus of the gameplay of the game, making it a sort of 3rd Person shooter, as well as various other attachments for the device. This is a radical idea was very widely accepted; no one really questioned it. Super Mario Galaxy, as far as I remember, was the first game to have space as a heavy theme, but no one complained there. It also extremely radicalized Nintendo’s definition of “Platformer Game” making it extremely unique. Mario can do that sort of thing. There are very few Zelda spin offs, with the majority not even having Link as the main character. The Mario series has so many reoccurring characters and breathing room that they can do whatever they want. They even have a Dance Dance revolution game with Mario; if they were to have Link and Ganon duking it out on the dance floor, people would boo them right off, but Mario did it and I saw no complaints (although the game didn’t do very well in sales). An excellent example of people hating Zelda out of its element is the Zelda CD-I games. I’m going to just start off with this: You all hate the game, but how many of you have actually played them? I’ll admit, I haven’t played them, but I’ve ready plenty of reviews and watched all the episodes of the Angry Video Game Nerd dealing with the topic. But not all 2nd and 3rd party games were failures. Really, the only handheld Zelda game (If we don’t count the A Link to the Past remake, but even then, Four Swords was also 3rd party) that wasn’t made by a 2nd or 3rd party developer was Link’s Awakening. The Oracle games, The Minish Cap, and Four Swords Adventures were each a big success. However, on Mario’s side, the Mario CD-is were also failures, but with at least working and decent gameplay. Again, check up on the Angry Video Game Nerd if you want a taste of that. Zelda has made very few masterpieces; but when they do, they are absolutely amazing. Ocarina of Time is arguably the best game of all time, but they can never do another to outsell a competing game. Zelda can’t add many twists to its already repetitive gameplay, for they have just too many classic styling fanboys. Super Mario Galaxy 2 combined two of their very successful Mario game’s gameplay to create this game, combining the overworld styling of Super Mario Bros 3 (And many others) with the traditional worlds styling of Super Mario Galaxy to create something new. Zelda doesn’t really have two games to combine. Majora’s Mask is very different from the rest of the series, perhaps the most different (save Adventure of Link). Fans either loved the game or loathed the game, but that just proves that if they put a tiny spin on something, they get too crazy of results. With the announcement of Skyward Sword, we had promises of an entirely new style of game. Miyamoto promised Twilight Princess would be the last of its kind, but when E3 came, Skyward Sword looked quite similar to past games. While Mario only made appearances in spin off games, the promise of an entirely new style of game didn’t really happen. There aren’t many details on Skyward Sword, so this may change upon the release of the title, but with the information we have now, controlling the game is really the only thing completely new. All in all, they are both incredible games, but both are heading down a path that will put the other in its place; Mario being as the most superior of all games and Zelda being the inferior that just couldn’t keep up. With the news of Skyward Sword, it sounds like they’re taking some bold moves that could alter this entire article, but we’ll just have to wait and see if this is for the better or for the worse.